Our last cocktail recipe was about how to turn average vodka into remarkable gin so, it seems only fitting that we make a remarkable cocktail with it. And what could be more appropriate than using some handcrafted ingredients from the world’s current hotspot for cocktails, Brooklyn, NYC? I was gifted a bottle of Royal Rose cardamom-clove simple syrup by a special someone who knows I have a penchant for rare things in bottles. And, while Royal Rose is not rare, per se, it is special. Like, you want-to-wear-it-as-cologne special. I didn’t. But I did experiment with our gin and had brilliant results. We’re calling this cocktail the Cardigan as it seems like the perfect bridge from winter to spring. I’m not willing to give up my warm spice flavors just yet so we put them to use alongside a springtime staple, gin. The Cardigan is a spicy, warming drink with just the right tartness, bitterness and bright citrus and floral zip. Combine all ingredients to a shaker full of ice, stir swiftly for 30 seconds and pour into a rocks glass with cracked ice. Garnish with a orange or lemon twist. We experiment with making syrups and liqueurs at home. Allspice infused liqueur, green tea and honey “syrup” and maple and bourbon mashups have all had some successes and some failures but to date my favorite is still our housemade Triple Sec. 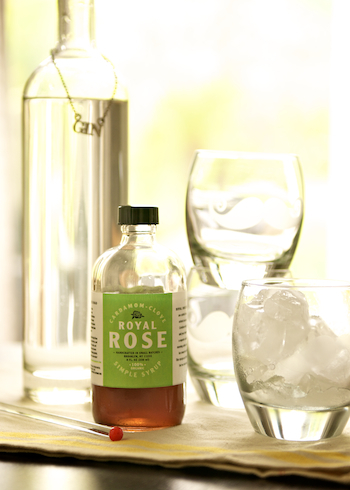 Royal Rose, along with a few other small producers are turning out fantastic flavor combinations set to syrupy mixers. They are becoming more widely available and will elevate your cocktail building experience. Have a simple-syrup sweet tooth? Let us know on Facebook, find us on Twitter or drop it in the comments below. Cheers! Photos by Gary Allard Copyright © 2012, Pybop, LLC (for thursdayhappyhour.com). All rights reserved. Questions? Happy hour ideas? Chat with us on Twitter: @thurshappyhour. LOVE this one! Totally worth it.